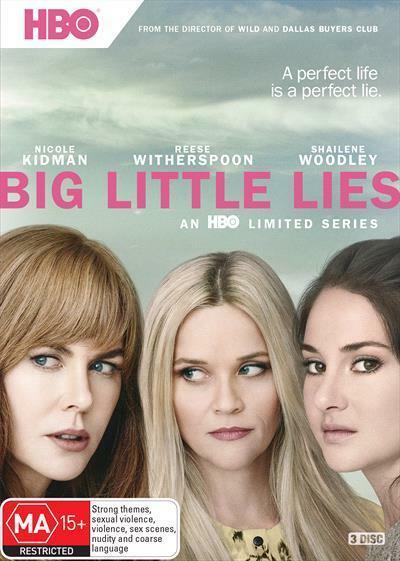 Fantasy dreamscape flashes to nightmare, and back again, in the HBO limited series Big Little Lies, based on Liane Moriarty’s bestselling novel and masterfully directed by Jean-Marc Valee (Wild). Everything about this vivid, immersive production works: top-notch performances from a uniformly excellent cast (including career-high turns from co-producers Nicole Kidman and Reese Witherspoon); tart, tender screenwriting; mesmeric cinematography capturing the beautiful surfaces and submerged ugliness of these privileged oceanside lives; and a perfectly pitched soundtrack that meshes intricately with the action, its songs often chosen as mood music by the characters. Monterey, California is the setting for a school dominated by mothers who channel their frustrated ambitions and reflected insecurities into playground politics. Stay-at-home mother Madeline (Reese Witherspoon), variously described as ‘a bulldog’ and ‘Betty Crocker’, spontaneously befriends newcomer Jane (Shailene Woodley), a young single mother (tagged as ‘a dirty old Prius parked outside of Barney’s’ by a mean-girl mum) on the day that her son Ziggy is accused of hurting the daughter of manically upbeat tech CEO Renata (Laura Dern). Alpha females Madeline and Renata declare proxy war, waged through children’s birthday parties and community theatre. Celeste (Nicole Kidman) is drafted by best friend Madeline, and alongside a burgeoning friendship between the established pair and Jane, we watch two seemingly ideal marriages secretly founder. We first see Celeste in close-up, all hair and lips and porcelain features, twisted in a grimace that could be ecstasy or anguish, while ‘Victim of Love’ plays over the image. As the camera zooms out, we see she’s mock-reacting to her young son, who’s play-shooting her; then the background slowly comes into focus: the deck of her glamorous home, the ocean behind it. Her peers envy the passion they glimpse in Celeste’s marriage to Perry (Alexander Skaarsgaard). But it comes at a price. Conversely, the easy companionship between Madeline and amiable husband Ed (Adam Scott, often seen with a tea-towel on his shoulder) seems to preclude passion, to their separate frustrations. Meanwhile, Jane has a troubled past that will come to involve them all.